Amidst talk of a second Great Depression, many Americans are wondering what's become of "The American Dream." Wondering if, indeed, their children will be better off than they are  or if they can even hold on to what they have now. As part of the Deepening the American Dream project, THE JOURNAL has been asking guests and viewers for their visions of the future of the American Dream. Is the American Dream in danger? 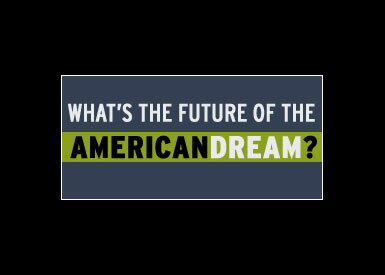 Or is there more to the American Dream than what we once thought? Peruse the dreams below and then add yours on the Deepening the American Dream blog. SCOTT BITTLE: I think my vision for the future of the American dream would be an America where the public is really engaged in making the decisions that affect their daily lives. Right now, of course, we have elections where people make choices. But the fact is, in this country, we treat politics like it's sports...It's about being engaged in decisions between elections, in their daily lives, so people feel they have control, they have a say, that their voice counts. These are things we're really lacking right now. And I don't think we can have the American dream without that. JANE MAYER: As a reporter I have to say that I hope we live in a country where people can get great and balanced information and newspapers can still deliver it. GLENN LOURY: What I hope for with the American dream is that we as a nation would adopt the capacity for constructive self-criticism to a greater degree than we have done. And not rest on our laurels; and not be content to pat ourselves on the back  the greatest nation in the history of the world, the freest country in the world, the propagator of the values of progress  and so on. But that we would come to be able to learn from our mistakes. PHILIP PAN: I guess my vision for the future of the American dream would be this continues to be a country that welcomes people from around the world, and people coming from different backgrounds and different situations. People, especially, I think, people who are facing hardship overseas. This country continues to bring them here and give them opportunity. JONATHAN LANDAY: I want to be an optimist about where the American dream is and where it's going, but it's really hard in these circumstances. And I think maybe we're going to have to start redefining what the American Dream is. The American Dream, for a long time, was powered by petroleum and easy credit and values that have been severely compromised in recent years. And I think in order to restore the American dream or at least reconstitute it in a more modest way, we're going to have to reexamine all of that and come to new conclusions and ideas about how we incorporate those into the future of this country. SAMUEL RODRIGUEZ: There must be a prophetic element [to the American Dream]. Prophetic means speaking truth, truth telling, truth to power, justice, righteousness. Addressing the issues of those that are around us in need. Caring for every single person around us. The collectiveness of the village, the culture, of looking beyond ourselves. And making sure that at the end of the day, we leave a lot more behind than we ever take away. KATRINA VANDEN HEUVEL: I also think of a country that doesn't have as downsized a politics of excluded alternatives that we live with now. And that citizens are allowed  given the space in our culture and politics and media  to unshackle their imaginations and think boldly about what their dreams are. Because there's no one dream. One way to look at the American Dream is through the prism of some of this nation's greatest authors. The American Dream is Gatsby, is Huck, is Raoul Duke. It is a striving and a battle for those things which Humanity can never fully put their fingers on, cannot grasp, but know in the soul to be essential, self-evident, and better than any coin or any grand applause. As Thomas Paine said, "The cause of America is in a great measure the cause of all mankind." It is our cause, and in a greater sense, our duty, to see America become the bloom of Humanity as it was (or even if it wasn't) aimed to be. As a nation we have a choice  we can die alone, floating in our own individual pools, or we can clasp Jim's hand, put tires to Highway 60, and blaze into the sun of what America and Humanity can and ought to be. Several months ago, we asked viewers what books they thought the next president should have on his reading list. See what they picked and add your own suggestions. Bill Moyers talks with one of the world's most successful investors, George Soros, about the global capital meltdown, how he saw it coming, and what can be done now. Bill Moyers checks in with JOURNAL contributor and director of the Annenberg Public Policy Center Kathleen Hall Jamieson on how dirty politics will play out in this final stretch to the election. In this web exclusive essay, on the sixth anniversary of the congressional vote to grant President George W. Bush the power to invade Iraq, Bill Moyers looks back to October 2002 and the Senate debate over the rush to war. Stefan Forbes' new film documents the career of Republican party strategist Lee Atwater. Is the American Dream in danger during our financial downturn? Or is the American Dream now about something new? Our guests and our viewers speak out.